Rabbits require very little space to live and nurture their young. In the wild their warrens are just big enough to turn around in and nest their kits. The warren is also just tall enough to allow their ears to stand up all the way while the rabbit lies down. Our housing systems are designed and built with that in mind. 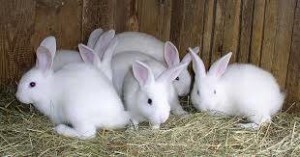 For every 28 square foot, you can raise 640 baby rabbits annually for a combined live weight of 3200 pounds. You can find Hutches and cages here. Seventy percent of America’s tillable soil/ known farmland is allocated to growing food for our food. Vast seas of corn and soy beans sprawl out over the country side, mostly intended for cattle. Cattle require an average of 9 pounds of feed for every 1 pound of meat. Rabbits require 1.5 pounds of feed for every 1 pound of meat. 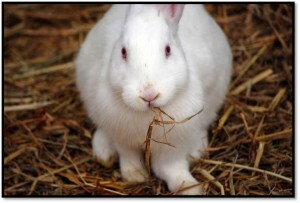 If retail rabbit pellets are used, rabbits cost 7-8 cents per day to feed. If barley grass and “Cut and Carry” methods are used, the cost will drop below 2 cents per day. On pellets cost per pound (live) will be around 78-81 cents. On barley and garden scraps cost per pound could be under 20 cents! !